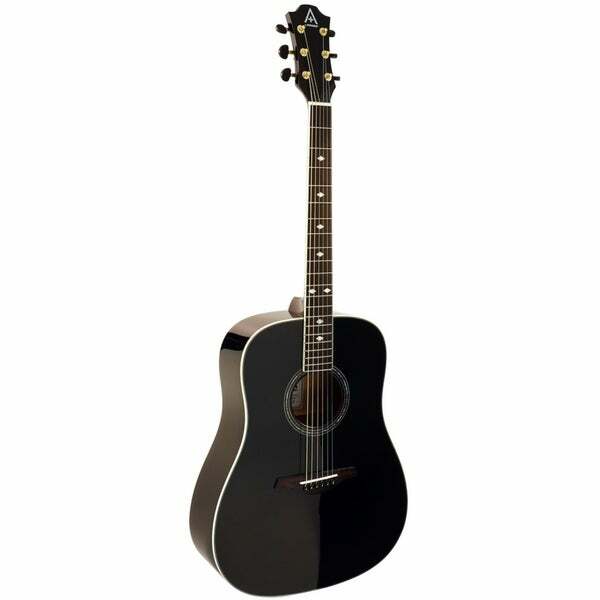 The A+ 300 series consist of the model 305 (featuring a laminate top, dot inlays, chrome hardware with matte black tuning pegs) available in Tobacco sunburst, Black and Natural satin colors as acoustic full – body instruments or, with a cutaway and a pickup/pre-amp featuring an on - board tuner, and the model 355 (featuring resonate solid tops, diamond inlays, gold hardware with matte black tuning pegs and inlaid rosette). The 355 dreadnoughts are also available in Tobacco sunburst, Black and Natural satin colors as acoustic full – body instruments or with a cutaway with an enhanced pickup/pre-amp featuring an on - board tuner. All 300 series dreadnoughts incorporate many special A+ feature and construction advantages that A+ instruments are known for and ship with a padded, black gig bag. Dimensions 5.0 In. X 16.0 In. X 41.5 In.